This week we are going to dive into the topic of root canals and hopefully dispel any misconceptions that you may have regarding one of dentistry’s most feared procedures. In a recent survey completed on behalf of the American Association of Endodontists, more than 70% of people stated that they were fearful of root canals. We wonder how many of these people are actually fearful of the procedure and how many of them are really just scared of the unknown. Today, we hope to describe to you the details of a root canal in a way that makes sense to you. We also want to tackle some of the frequently asked questions that we hear from our patients and read about online. By doing this, we hope that we can get rid of some of the fear of the unknown that exists surrounding this procedure. For a general overview of root canal treatment that we do here, please visit this our root canal section of our website. Why Does My Tooth Need a Root Canal? There are many reasons that your tooth may need a root canal. Usually, your dentist can decide whether or not a tooth needs a root canal based on the x-ray and your symptoms. Other times, however, your dentist may not be able to decipher whether or not your tooth needs a root canal until after some of the tooth is drilled out. The pulp of a tooth is the innermost layer of the tooth that contains the nerves and blood vessels that keep the tooth alive. The pulp is soft compared to the hard outer layers of the tooth. When a tooth needs a root canal, it is usually because the pulp is no longer alive, is in the process of dying, or is at risk for bacterial contamination. A tooth with a contaminated pulp cannot live for very long and usually causes pain, swelling, or infection. Some of the reasons that a tooth may need a root canal are because of large cavities, large fillings, dental abscesses or infections, and traumatic injuries that cause fractures. As we said before, a tooth that needs a root canal has a pulp that is either dead or dying and can no longer nourish the tooth like it is supposed to. The pulp is usually infected with bacteria. In order to restore the tooth back to health, the entire pulp must be removed and decontaminated. To perform a root canal, your dentist will first make sure that your tooth is completely numb. Many people fear that a root canal will be very painful. 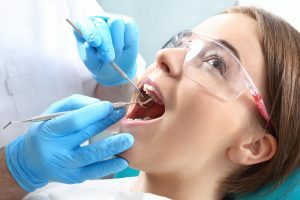 With recent advancements in numbing medications and techniques, your dentist should be able to ensure that you tooth is completely numb before proceeding with any treatment. The dentist will drill into the pulp of the tooth and remove the infected tissue. Using a combination of drills and medications, your dentist will remove the pulp and bacteria from deep in the roots of the tooth. Finally, your dentist will fill the root canal and pulpal space of the tooth with a filling material that is designed specifically to help the tooth to heal from within. For more information on the steps of a root canal, please watch the following video from The American Association of Endodontists. Will My Tooth Need Further Treatment After the Root Canal? Before you dentist begins the root canal, he or she will speak with you about the need for placement of a final restoration on your tooth. If the tooth has a lot of healthy tooth structure remaining, your tooth may only need to have a small filling placed after the procedure. If the tooth is severely broken or has a large cavity, however, the tooth will need to have a crown or cap placed on it after the root canal is completed. Should An Endodontist Complete my Root Canal Treatment? An endodontist is a dentist who has completed a residency and received extra training in completing root canals. Any dentist can perform root canals, but sometimes your dentist may refer you to an endodontist to have the root canal completed. If your dentist refers you to an endodontist for the treatment, it is because your dentist thinks that additional training is necessary to adequately treat your tooth. This may be due to the size or shape of the tooth or it may be because this tooth has already had a root canal and needs to have the be retreated. This Seems Like a Hassle—Why Not Just Pull the Tooth? All dentists agree that, whenever feasible, it is best to save a natural tooth. Although implant technology has improved significantly, nothing is able to function as well or look as good as a natural tooth. Your dentist always has your best interest in mind and will recommend what is best for your tooth and for your overall health. We hope that you learned something new today! If you were fearful of root canals before, we hope that you are a little bit more comfortable with the procedure after reading this article. As always, if you live in or around the Bonita Springs or Estero areas, do not hesitate to contact us at any time electronically or call (239)449-6104.